There are lots of things you can do with Atari software. I do graphics and I have an old Roland Camm-1 vinyl sign cutter to produce letters and cut out logos which can be stuck on windows and signboards. If it's only some typographic work with words and letters, I do the artwork in Calamus SL, convert it to a vector graphic and export it to GMA-Plot which does the cutting. In Calamus, I type in the size of the original signboard as the document size, then I do the type graphics and import logos. Figure 1: Typing the text for the logo. Figure 2: Vectorizing the logo. Figure 3: Re-sizing the logo. Figure 5: Taking the size. I convert the typographic artwork into vector graphics with the Bridge module and reduce the frame to the target size with the vector module. Then I write down the height and width of each vector frame. Logos which I have imported don't need to be converted. I just note their size. When I import the vectorized words, letters and the logos to GMA-Plot, I just give the noted size and cut them out. Some water on the plastic board, and I can apply the letters and logos easily. So I get the signboard exactly the way I planned it in Calamus SL. The problem comes when the customer wants a logo to be included. OK, I can scan the logo and vectorize it with Avant Vector. In fact I have done this many times. When a logo is cut out, it needs to have very clear lines, which means no automatic vectorization. It would save a lot of time to convert an existing logo which might be found at http://www.logotypes.ru, from EPS (Encapsulated PostScript) format to the Atari vector format CVG (Calamus Vector Graphic). The first Atari program which claimed to be able to convert EPS (Illustrator 88 EPS format) to CVG was Avant Vector Pro from Trade It, in 1991. Well, it worked, but as far as I could tell, only EPS coded by PC programs like Corel Draw 4 and CasMate. No chance to read EPS files made by Illustrator or Freehand. Even the new Corel Draw is not compatible any more. Calipso doesn't rock 'n' roll! 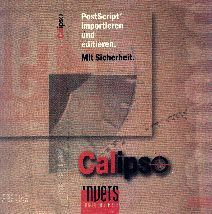 Some time ago, Invers Media introduced its PostScript reading module, Calipso. It should be able to read PS printer files which should be PostScript level 1. This means it should import any layout saved as a PS printer file, in theory. But it almost doesn't work in reality. There is also the EPS level 1 format. Calipso did indeed import tons of EPS from an old EPS collection. These were in level 1 format created with Illustrator 3, but importing newer EPS files with Calipso won't work. Even though I am a Calamus addict, I am not very happy with this module. I have to read and save EPS files as "clean" level 1 with Corel Draw 8 first. Only older logos, some made with Illustrator 3, go straight into Calipso. More complex vector graphics can't be converted at all. I tried to save EPS with Illustrator 6 as Illustrator 3 format to import with Calipso - it doesn't work. Calamus needs a reliable EPS import to survive, which should be included in any version. On my last graphic job for a congress organizer I had to vectorize some logos for PainMaker 6.5 (that's a nickname for Adobe's PageMaker - Ed). I secretly installed STEmulator and did the vectorization with Avant Vector Pro, exported it as CVG and wanted to convert it with Arabesque 2. OK, Arabesque 2 didn't work with STEmulator, so I installed the 10-minute trial version of MagiC PC from Application Systems Heidelberg and got a perfect EPS, which I re-colored in Illustrator. The other way around works too, Arabesque 2 eats almost any EPS. But Arabesque 2 didn't work with MagiC Mac on PPC either. You will need a real Atari, MagiC PC or work with MagiC Mac on a 68K Mac. Application Systems Heidelberg (ASH) brought out a new vector graphic program by the name of ArtWorx, which can be expanded with an EPS module. This software works, of course, with MagiC Mac from ASH. I have done some conversions with it and it works fine, if not, I import it to Corel Draw (on my Mac) first, export it and then it will work. So I recommend for real Ataris Arabesque 2 and ArtWorx, and for emulators ArtWorx only.